Provide the means for students to identify North American wildlife from their tracks alone. Students not only learn to identify various species, they are also given the opportunity to reproduce these tracks and tracking patterns. Species included are deer, raccoon, gray squirrel, cottontail rabbit, and striped skunk. The mold kits include durable, vinyl-rubber molds from several species cast from the real thing, as well as 4 lbs. of casting plaster for students to create their own casts, either from the molds or from prints they find in the wild. The replica kits include highly-accurate reproductions of feet, also cast in vinyl-rubber, from several different species and an ink pad for you to make ink prints or patterns on a sand-covered table. 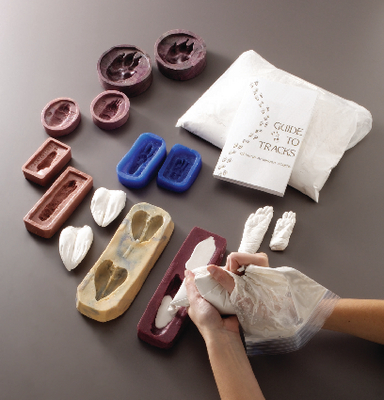 Combination kits combine all of the contents of both the mold and replica kits. A reference sheet and the book Field Guide to Tracks of North American Wildlife is also included.